Brilliantly line your walkway or separate your landscaping using the Panacea Aztec Sun Border Fence. The bold centerpiece, natural hue, and sturdy construction of this fence section will certainly bring an exciting look to your backyard. A stylized sunburst occupies the center of this fence, with a spiral detail inside it and uneven rays for a dramatic effect. Curved metal rods emanate from this sunburst, intersecting the straight support rods for fun contrast. 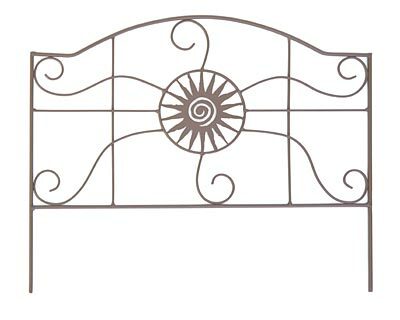 A gently arched top completes the item, and the soft brown, powder coated finish blends with your plants. Place the 4.25" long legs into your soil, creating a barrier between your favorite flowers and your lawn. Enhance your landscaping with a stylish fence using this Aztec Sun Border Fence. Note: This case pack includes 12 of the Panacea Aztec Sun Border Fence Sections.